Tega Cay Wash & Lube offers brake replacement and repair near you with the best service, call our brake shop and learn more how you can save. With the best brake pad replacement & brake repair in Fort Mill, we’ll service your car fast with our quality certified mechanics. Our brake shop isn’t just the cheapest brake pads and rotors for less in Fort Mill, we install the best brake parts from Napa Auto Parts & we’re a Napa AutoCare center. 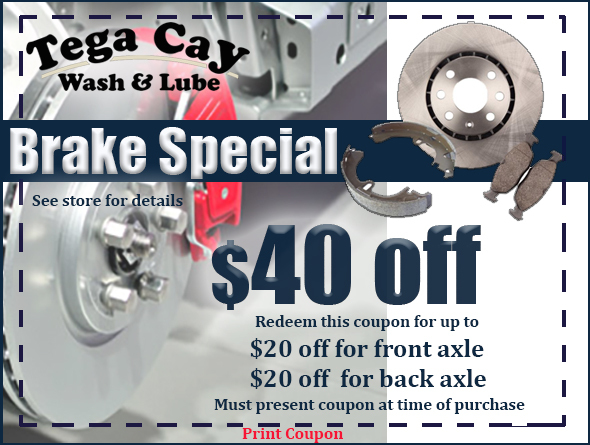 If your brakes are grinding or squealing, for your safety search brake shops near me or visit Tega Cay Wash and Lube. We provide a free inspection for brakes and brake pads plus many more brake services. Please click on the links below to learn more about your braking system and how brakes work and how we can serve you best.